The photo to your right contains just a small fraction of the international origami peace cranes we have thus far received for our International Origami Peace Crane Tree project. 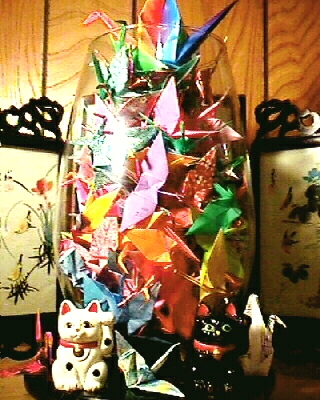 The cranes are in a 12 inch jar which is guarded by a white and a black Maneki Neko (Beckoning Fortune Cats). The cranes we receive will be sculpted into a weeping-style wire bonkei bonsai as leaves and flowers. The tree is a memorial to all the victims and heroes of the 9-11 terrorist attacks in the United States. The tree symbolizes global unity and hope as people of all ages, colors, nations and religions gather and work together to stop the hatred and ignorance which has claimed so many innocent lives.